Grooveshark is pretty awesome, which can mostly be attributed to the fact that the service can be used without registering an account first. That's rare on today's Internet. Grooveshark is a web application that you can use to find and play music. You can use it to discover new music, tune into genre based radio stations and check out what's popular in general. Registered users get extra features like the ability to save playlists. One thing that you cannot do with Grooveshark is to control the music player with your keyboard's media keys. If you want to skip a song you need to go to the web page and do that. That's where the Windows desktop player WinGrooves comes into play. It basically is a 1:1 copy of Grooveshark in your web browser, with the benefit that it fully supports keyboard media keys and customizable hot keys that work everywhere. The program seems to be using the Internet Explorer rendering engine (correct me if I'm wrong). Adobe Flash needs to be installed on the system as well. 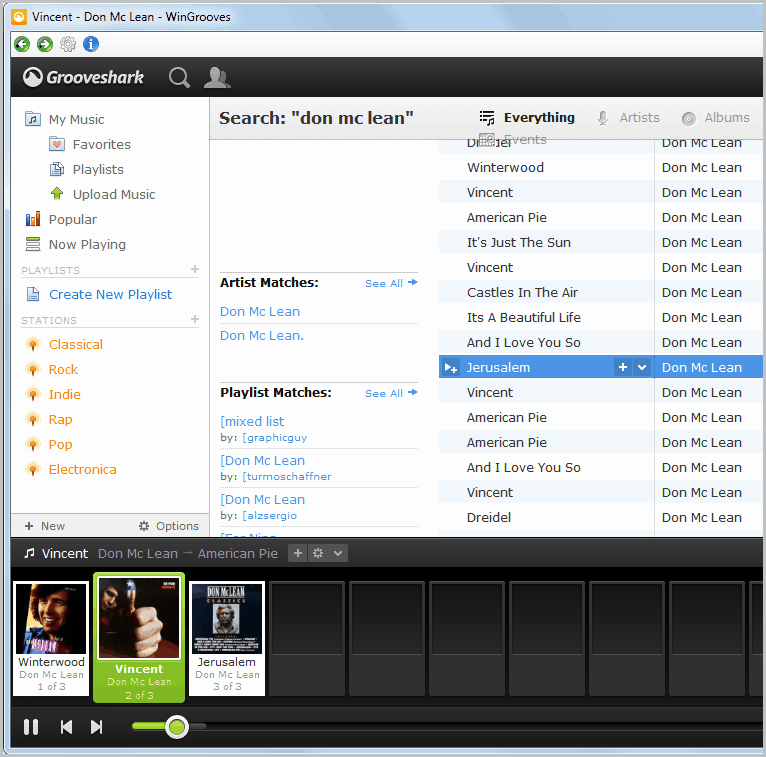 Wingrooves displays the standard Grooveshark layout after it has been started. Users can use the search to find a song, tune into one of the stations or log into their Grooveshark account to access their personal music collection or playlists. Groveshark ads are displayed in the application which is remarkable, considering that this is the main source of revenue of the service. Members who pay a small fee can remove the advertisements to support the service further. You can then minimize the application and music will continue playing in the background. 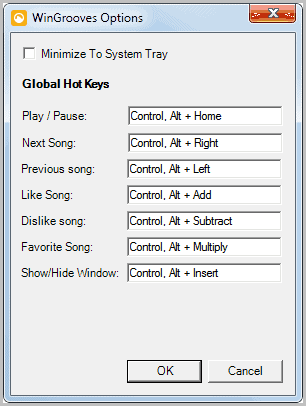 A click on the options button in the main interface displays all hotkeys that are configured. They all make use of Ctrl-Alt and another key and can be changed in the menu in case you like to use different keys. Users with media keys can ignore those keys outright and use the media keys on their keyboard instead. WinGrooves is only available for the Microsoft Windows operating system. No additional compatibility information are provided. It looks as if the program requires the Microsoft .NET Framework to be installed, but it is not clear which version it requires. Previous Post: « Does it really matter if we don't upgrade our PCs anymore? Yet another streaming downloader – and this one also insists on downloading and re-installing .Net over a perfectly working installation. Free software is always welcome. But why can’t developers (especially those we don’t know and have never heard of) simply give us installation programs we can check and assess? I love Grooveshanks, but in this case – thanks but no thanks. So this is like Spotif only in the bowser. I can host the programs for you if you like. I never download a program that requires you to download the setup program online….you never know what you hare going to get. In this case, as already mentioned, a full installation of .net is done – no check to see if you already have it. This is just bad programming. For shortcut keys, autokeys already has a script for GrooveShark. This is the author of WinGrooves. Thanks for posting about it and giving your feedback. I’m glad that you are finding it useful. I apologize if there are any problems. You can chock them up to the fact that this is my first C# application. It does use the Internet Explorer engine to load GrooveShark and requires .NET 4.0 to work. I updated the FAQ page to mention this. I’m sorry to see that people are having issues with the installer. I just used Microsoft’s ClickOnce installer because that was the easiest way to release it and provide updates and I didn’t have time to research other methods checking for .NET and automatically downloading it if necessary. If anyone has a suggestion for how to avoid reinstalling .NET when another version is installed, I’m open to it. I think there is a Client Profile version of .NET but the application didn’t work when I selected that as the target Framework. As long as wingrooves is “Beta” I will continue usung Prism as portable GrooveShark application.